Registration is open for the 2019 Public Health Combined Conference, which this year runs from May 13-15. The theme is “Health Equity: A Public Health Mission for Justice”. This aligns with OPHA’s Health and Equity in All Policies initiative. OPHA’s Public Policy Institute will this year focus on Children and Health Equity. It will be held on April 3rd as a half-day webinar to recognize geographic diversity and limited budgets. It will as always feature dynamic speakers representing the wide spectrum of diverse and pressing issues of the day for public health in Ohio. Registration details can be found HERE. Recognize a Public Health Professional! OPHA members, do you know a public health professional who deserves state-wide recognition? We are accepting nominations for our annual Awards, presented at our Celebrate Public Health Awards Dinner on May 14. 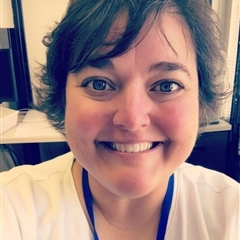 My name is Dusty Huff and I have been at Public Health Dayton and Montgomery County since 1997, first as a registered nurse and now as a family nurse practitioner. Over the past 21 years, public health nursing has etched its place firmly in my heart and I love providing care to the community that I call home. There have also been many patients that have made a lasting impression on my heart and mind, so I decided to share this story. Several years ago I was working in the immunization clinic and was called to help a coworker with a child that was less than thrilled to be there. When I walked into the room there was a small boy hiding behind the door with tears silently streaming down his face and splashing onto the floor. As I tried to coax him out of the corner, I noticed that he had something written in ink on his red t-shirt. When I asked him what it said, he repeatedly said “I don’t know” and just shook his head while looking at the floor. The adult that was with him that day told us he had written Spiderman on his t-shirt because there was going to be a Halloween parade at his school later that week and he did not have a costume. Long after this child had left, I couldn’t shake the picture of sadness in his eyes and I decided to ask the registration staff if they happened to catch the name of the school he attended. As luck would have it, one of them knew! After calling the school to ask if they would deliver a costume to the child if it was brought to the school the hunt was on for a Spiderman costume. Armed with money that our staff had collected, I went to several stores unable to find a costume. I did however find a Batman costume, which I purchased and delivered to the office the next morning. I never told them where I was from, just who the costume was to be given to. A couple of weeks later, a thank you note arrived from the boy’s teacher explaining how much it meant to him and that he marched proudly in the parade as Batman. She went on to say that she had been his teacher for 3 years and this was the first time he had a costume. Tucked inside the note was a polaroid picture of a boy dressed as a superhero, arms raised triumphantly in the air looking like he could conquer the world. My hope for this child is that he feels valuable, he knows that people care about him, and maybe one day he will have the opportunity to pay it forward. I still have his picture and I look at it from time to time when I need a reminder that good trumps evil and that superheroes really do exist! I’m writing to raise awareness of the Ohio Public Health Association’s Health and Equity in All Policies Legislative Initiative. Senate Bill 302 (Tavares), the Health and Equity in All Policies (HEiAP) Initiative, seeks to create a standardized, systematic review process for determining potential impact of proposed legislation on the health of Ohioans. The bill calls for a health and equity impact analysis at the early stages of policy development and is meant to inform Ohio lawmakers of any potential negative health and equity consequences. The analysis would additionally help lawmakers identify those populations most susceptible to unfavorable health outcomes from any proposed legislation. Further, the review would allow legislators to consider how proposed bills would impact the population’s health through other health influences such as water and air quality, access to public transportation, social services, food security, education and good jobs. We sincerely believe this legislation could be one of the most important public health policies to have been considered in Ohio in many years. And, if enacted, this legislation could be a significant factor in turning around both our poor health rankings and the inequities that exist among our fellow citizens. We will be reaching out to you for advocacy efforts on this initiative. In the meantime, for more information, please see the following link: https://ohiopha.org/about-opha/sections-and-subjects/heiap/ and please reach out to me if you would like to become more actively involved in this initiative. Thanks for your continued efforts in public health! The Ohio Public Health Resiliency Coalition formed by OPHA has released a resource for addressing the public health impacts of climate change. The document looks the potential adverse outcomes that Ohio communities may face and suggests adaptations public health professionals can make. It was released during the 2018 Public Health Combined Conference. The full release follows. OPHA and the American Planning Association partnered to present the 2018 Public Policy Institute on June 21st. The PPI focused on integration between public health and planning. State Senator Charleta B. Tavares (D-Columbus) recently introduced a bill, Senate Bill 302, to improve Ohio’s poor health indicators by requiring the State to determine how all new rules and regulations would impact the health of Ohioans. Like Ohio’s Common Sense Initiative, which looks at the impact of all laws and agency rules on business and the economy, SB 302 would require an analysis of all pending bills and agency rules to determine if they will have a positive, adverse or neutral impact on the health of Ohioans and on the attainment of health equity in the state. The legislation, which is supported by the Ohio Public Health Association (OPHA), aims to demonstrate how even factors such as education, housing, neighborhood safety, transportation and employment can have wide-ranging health implications.